We all hear that play is important for children. I know it’s important. It’s their work; how they learn to make friends, negotiate, solve problems with objects, and solve problems with other children. Play is having fun, and it’s also very hard work. Learning how to pump a swing and ride a bike is a mountain of a challenge. So is learning how to ask for a turn, and to stick up for yourself. 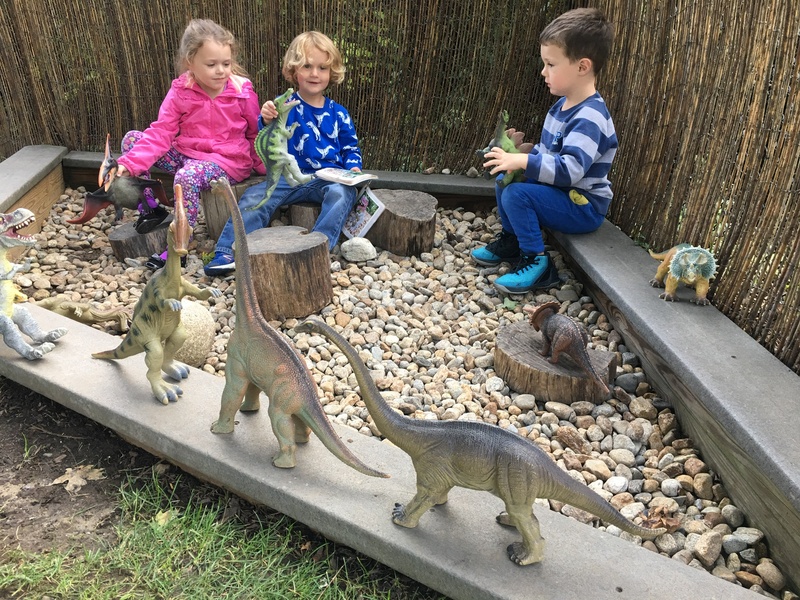 Recently I stood back and watched children playing in our Dinosaur Den at school. The conversation was lively, and they wanted to make the dinosaurs talk with each other. Then a child asked me to take a picture of all the dinosaurs. They had worked so carefully to get the dinosaurs all set up, before a dinosaur dinner. Do you see the dinner, the multitude of rocks. carefully lined up? I couldn’t get all the dinosaurs in one photo, so I had to make a video. This was very important to the children. And then it was time for the dinosaurs to have dinner. Do you know how long it took children to line up all those rocks? 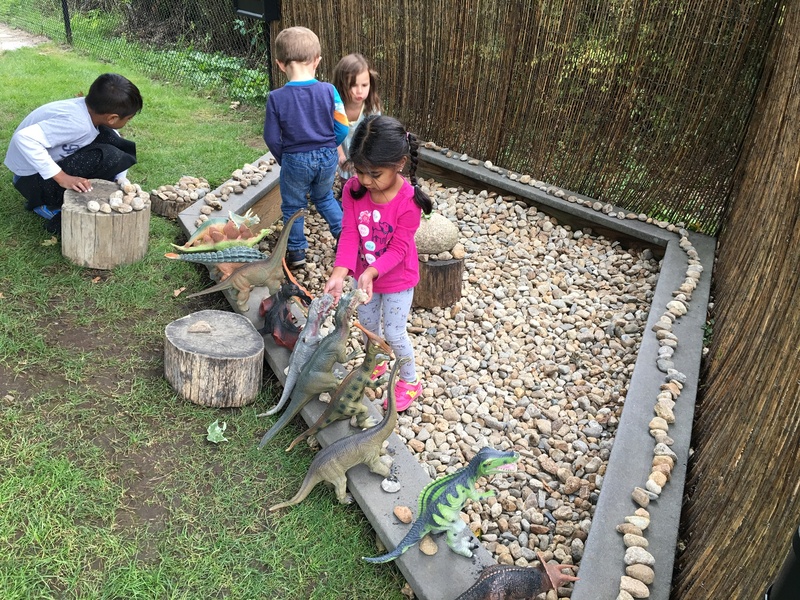 Can you see how carefully children are feeding and taking care of the dinosaurs? Do you see how they are working together? Children who play can better attend at school. Children who play have greater academic success. Children who play make friends. Children who play develop kindness, heart. Children who play are problem solvers. Therefore, children who play grow into adults who have the skills to become good citizens as well as good people. Isn’t that what’s most important? Take the flip side – when a terrible, evil situation happens at the hand of one person (Columbine, Sandy Hook for starters), I immediately think of what they were doing when they were four-years-old. 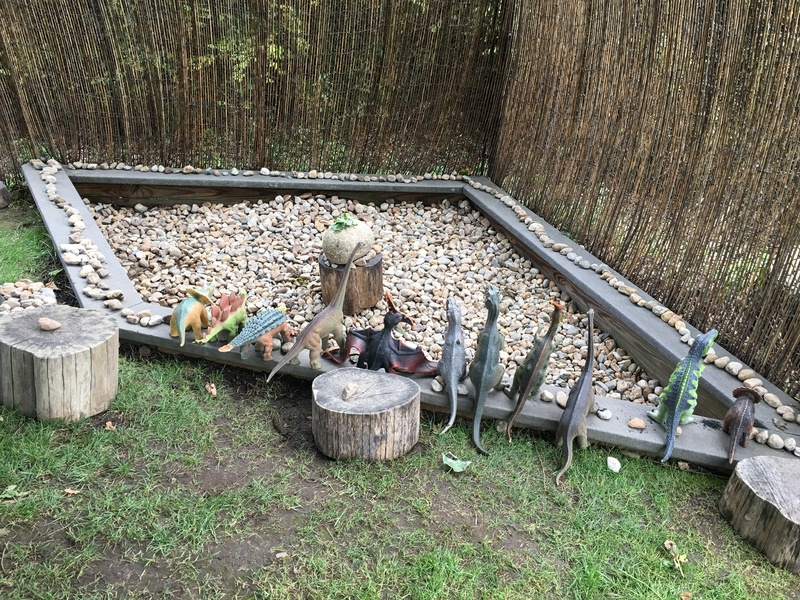 They did not have a Dinosaur Den in which to play, nor a Mud Kitchen. Therefore, they didn’t develop any life skills. So, when someone wonders if play is important, yes it is! This entry was posted in behavior, Early Education, Kindness, Play, preschool, Teaching young children and tagged Early Education, Imagination, teaching young children, the importance of play. Bookmark the permalink. I love it – just going to read all of your heartwarming piece in a bit. Playing builds teamwork skills, the most important skill to have in the world of employment according to surveys with employers. When I interviewed people for a living, I could usually tell if they had learned how to play as children. Of course, playing builds many other skills as well especially problem-solving. It must be rewarding for you to watch these skills develop. I love the dinosaurs!! I love what you said, Darlene. You hit the nail on the head. Teamwork is definitely top dog in the world of employment. Like you when you interview, I can usually spot the people who didn’t play as children. And the list grows beyond social inequities. A study about ten years ago noted that new surgeons did not have the same degree of hand skills. The reason? Ooops! The reason is because they did not have the same opportunities to play outdoors- building forts, using sticks and rocks. Their hands were “trained” on a keyboard, not outdoors. Fascinating! Excellent, Jennie. Thank you for sharing. You are right, Jennie. It is creativity that makes some people great as they are the ones who can make the leaps of logic and inspiration with inventions. Well said, Robbie. Thank you. The dino den looks like loads of fun! Thank you, Deborah. It is a magnet for fun as well as learning. You are so right, Jennie. This is an adorable post. I was smiling all the way. Loved the dino den and everything about it. Hugs. That’s a very impressive dinosaur den! Fun to watch them play and to remember how important it is to do so. Here is another wonderful post from Jennie, an excellent teacher, on the importance of play! That is so nice, Will. Thank you! Oh gosh I was in a tk class today and the kids at times played great but they couldn’t share , kicking and punching each other. I don’t know why and it broke my heart. That always makes me sad, and it usually means that they just didn’t have the words to tell the other child why they were upset. What did you do? I talked to them. Show them to use words. Thanks for this, I totally agree about the importance of children just being allowed to play 🙂 I’m here in Beijing now and telling the kids to have a break and ‘play’, instead of solid studying, brings a look of horror across most of the parents’ faces. There is so much focus on sitting behind a desk and absolutely zero on play/interaction. This society will have major problems in years to come.. I love the posts like this, in which you share the children’s work, Jennie. They make my heart sing and I wish I was right there with you all. You make me feel like I am! Such a wonderful post, Jennie. You are 100% right. I wonder if today’s seemingly dominant play, computer games, has an opposite effect? Does it promote more aggressive behavior and limits the skill of getting along? Thank you, Steve. I do think computer games, when they become a primary source of play, promote aggressive behavior and limit the ability to get along. But the child who is totally consumed with these games often did not have play skills to begin with, and computer games became the playmate. Loose-loose. And so sad. Please forward this to the Senate and the House of Representatives…since words don’t work maybe images would help! So important! It helps shape their behaviour as adults. So beautifully written Jennie. Play is indeed hard wok and we better take a child’s play seriously . Thank you for reminding. I couldn’t agree more, Jennie. I love to see children at play. I enjoyed that video and your photos. The dinosaur dinner was a clever idea! Bravo to the kids! I agree 100%- play time is sooo important and the results are always showing up later on. I love this post! Great message and what a fun parade. Yes! I love this. Play is necessary. And playing as an adult is really stinkin fun too!